In the beginning... 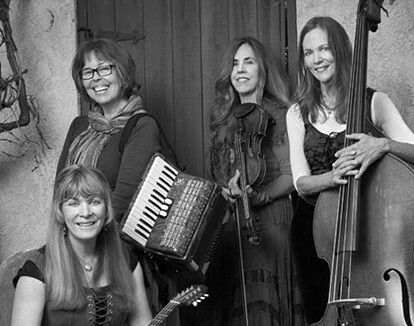 In a happy coincidence of co‐location, Jill, Brenda and then‐guitarist Mary Tulin met years ago in that hotbed of Celtic music, Bakersfield, California. Brenda and Jill moved to town first, and met at local musical gatherings, yet joined different bands. Mary arrived soon after and joined Jill's band, and later (finally!) so did Brenda. The three discovered a strong musical and personal synergy, and were soon off on their own. The name came easily. Brenda wanted to be in a band called Banshee. Jill liked the feminist ring of Barefoot in the Kitchen. Mary offered, “How about Banshee in the Kitchen?” And so they were. When Mary’s doctor husband retired in 2009, the two headed to the wilds of Washington State. Just when Brenda and Jill thought all was lost, Kat, who had taken dulcimer lessons from Brenda, mentioned she played guitar, and… well… you just don’t mess around with providence. She was in. Kris joined a few years later to make up the final foursome. On stage, National Champion hammered dulcimer player Brenda Hunter (fiddle, hammered dulcimer) and Jill Egland (flute, accordion, whistle) trade off inspired flights of lead and counter melody over dynamic backing by Kat Edmonson (six- and twelve-string guitar, bouzouki). No strangers to the microphone, the three trade off lead and backing vocals on a choice selection of songs, as well as jocular commentary in between. The sound is completed with the rich bass notes from Kris Wilber, alternating between her acoustic standup bass and electric bass.